Eating Therapy provides specialist Eating Disorders therapy for both Sufferers and Carers, and can now also be found in central Chichester, a more convenient location for clients travelling from a northerly or an easterly direction. 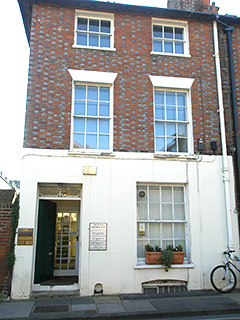 The Therapy Room here provides a peaceful space and is situated on the top floor of a practice that houses other therapies, including homeopathy and chiropracty. The most convenient place to park is in the Market Car Park in Chichester, as it is a 5-minute walk away – on foot, turn right out of the main entrance to the car park and make your way to the traffic lights at the top of East Street. Cross at the traffic lights, essentially turning left here into East Street. Then, take the first left into St John’s Street, and the first right opposite St John’s Church into New Town. New Town Consulting Room can be found just along on the left hand side of the street – you will see the Eating Therapy business plaque on the wall to the left of the outside front door. As you face the building, you will need to ring the gold coloured bell, on the top right hand side of the main inside door, labelled New Town Consulting Room. Please be aware that there is no waiting room, just as there isn’t at the Bosham practice, so it is preferable if you can wait to ring until 5 minutes before your scheduled session time, so that any previous client is not unduly disturbed. Thank you for your understanding with this. Your question has been received. I will get back to you shortly.